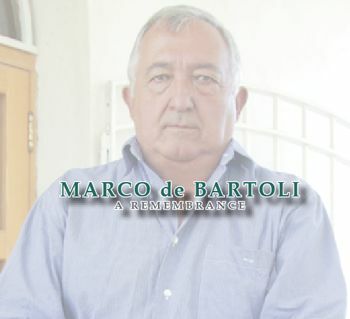 Marco de Bartoli was one of the key protagonists in the development of a quality Sicilian wine industry. Without the support of the Marsala wine trade, he proposed a version of Marsala that harked back to its historic roots and made no compromises to quality. He awakened Italy to the luscious dessert wines of Pantelleria. He brought attention to the two key vine varieties that composed his version of Marsala and the genre of Passito di Pantelleria, the vine varieties Grillo and Zibibbo respectively. In 1995, two years after he had received his greatest honor, nomination to be President of the Sicily Wine and Vine Institute (Istituto Regionale della Vite e del Vino or IRVV), Italian police under the direction of the Italian courts confiscated De Bartoli’s wine stocks and papers. He was accused of wine sophistication. De Bartoli and his business remained in limbo until 2OOO when he was absolved of all wrong-doing. Though he resumed his work in the wine trade, he never recovered from what he perceived as a wrongful assault on his honesty and reputation. On March 18, 2O11, Marco De Bartoli, at the age of 66 years old, left the world that both inspired him and disgusted him. De Bartoli was a small boy during the years following World War II. The port of Marsala had been heavily bombed by the US and British air forces during the war. The population was hungry and left in abject poverty. De Bartoli, however, was born into the mercantile aristocracy of the Marsala wine trade. His mother’s father was Paolo Pellegrino, owner of the important Marsala house, Carlo Pellegrino. In 1948, Paolo Pellegrino purchased an automobile for his daughter, Giuseppina, Marco’s mother. She was the first woman in Marsala to have a driver’s license and to own her own vehicle. I can imagine three-year-old Marco clutching his mother as she drove through the swirling dust and rubble of post-war Marsala. Young Marco attended schools appropriate to his social standing and went onto to study at the Marsala enology school. He graduated in 197O. A career in the then profitable Marsala wine industry was pre-ordained. He worked 5 years at Pellegrino and another 4 at Mirabella, another Marsala house. But during this period, his interest turned away from the wine business towards racing high performance cars. In 1979, scrapes with disaster convinced him to retire from racing. In subsequent years, he collected historic automobiles. In 1978, disillusioned by what De Bartoli described to me as, “the men, beasts and animals of Marsala”, he retired to the family farm, Baglio Samperi, in Marsala. There he amassed barrels filled with fine, old Marsala which he purchased from private stocks. By blending them with more recent wines using the solera system, he made a “Marsala” which naturally achieved an alcohol percentage of 18%. Historical accounts had described pre-Woodhouse “Marsala” as being unfortified and extant examples of artisanal “Madeira” can display comparable alcohol levels without fortification. Despite these facts, Marsala wine law would not admit the existence of unfortified Marsala. De Bartoli was forced to label his Vecchio Samperi with no mention of “Marsala”. Much to the irritation of the Marsala trade, he was quick to refer to it as the “real” Marsala. In 198O, De Bartoli released his Vecchio Samperi. He traveled throughout Italy and the world carrying the flag for his Marsala. Journalists heaped praise on De Bartoli and his wine. Despite this praise, De Bartoli found the wines difficult to sell. The international consumer had lost interest in fortified wines, such as Marsala, Sherry and Madeira, which featured barrel maturation flavors over fresh fruit. Fed up with the Marsala wine industry, De Bartoli turned his attention to making sweet Moscato Passito on the Sicilian island of Pantelleria. In 1985, he had great critical and economic success with his first release of “Bukkuram”, a sweet dessert wine made from dried Zibibbo (Muscat of Alexandria) grapes. Bukkuram jump-started the Pantelleria wine industry. De Bartoli’s other successes were the fermentations of Grillo and Zibibbo to make high-quality dry white wines, named Grappoli del Grillo and Pietranera respectively. Other Sicilian producers followed with their own versions. According to those who knew him well, young Marco de Bartoli was high-spirited and fun-loving. From the 198Os, however, De Bartoli increasingly became highly critical and argumentative. In 1995, I attended an IRVV sponsored symposium on the island of Pantelleria and was astonished by the amount of rancor that speakers delivered from the podium and that attendees delivered from their seats. As the then President of the IRVV, one would have expected De Bartoli to have flown above this rancor. Instead my vivid memory was that he was in the thick of it. De Bartoli took great pride in his ascendance to be President of the IRVV. It symbolized Sicilian recognition of his beliefs and efforts and gave him a platform to achieve more for Sicily. A few months after the Pantelleria symposium, the fraud police surrounded Baglio Samperi. I have never discovered anybody who could tell me how this legal assault on De Bartoli was engineered. De Bartoli, by the accounts of others, made his situation even worse by verbally assaulting the police and magistrates. Whether the accusations were true or not, if there had been a strategy to knock De Bartoli out of commission, it worked. Though he filled out his term as President, his tenure was not marked by great achievements. The creativity he displayed with Vecchio Samperi, Bukkuram, Grappoli del Grillo, and Pietranera never again shown so brightly. At the interpersonal level, bitterness and a pessimistic view of Sicily’s wine industry supplanted enthusiasm and hope. By many accounts, Baglio Samperi was the site of numerous family battles. During my visit in July of 2O1O, however, I saw no evidence of this. Renato, one of his two sons, showed great respect and support for his father. An enologist in his own right, Renato commandeers his own wine company, Terza Via, located at Baglio Samperi. He demonstrates the same fiery spirit and intelligence that his father had in abundance. His other son, Sebastiano, manages the De Bartoli operation on the island of Pantelleria. During our interview, Marco De Bartoli declared that the large, high-profile wine companies of Sicily, namely Tasca D’Almerita, Planeta and Donnafugata, had largely forsaken quality for quantity and profits. He noted the excitement engendered by the wines of Etna. He hoped that wine producers there would not similarly lose their way. A friend and longtime admirer of De Bartoli attended his funeral on March 21. He noted the presence of “mourners” whom he knew had previously spoken disparagingly of Marco De Bartoli. It pained him that these “mourners” looked down with false sympathy upon a De Bartoli who could not turn his head in disgust. My friend had admired De Bartoli because he had dared to freely speak “the truth”, something that Sicilians have historically found impossible to do even though they longed to do so. Infinite layers of cultural expectations and influence have tightly bound the Sicilian spirit. Perhaps they have bound us all and De Bartoli may be a symbol for everyone of us. Throughout my friend’s professional life as an enologist, he had felt that the flavors of Marco De Bartoli’s wines demonstrated the truths that De Bartoli enunciated. During my interview with him, De Bartoli proposed a declaration of self that might well be his own epitaph: “I am not of Sicily, Marsalas or Pantelleria. I am De Bartoli who makes Samperi and Bukkuram.